Thankfully, there’s no need to believe it. That’s the statistic cited on the basis of research done by Joseph Ugrin, assistant professor of accounting at Kansas State University, and John Pearson, associate professor of management at Southern Illinois University in Carbondale (in “The Effects of Sanctions and Stigmas on Cyberloafing”, published in the May 2012 issue of the journal Computers in Human Behavior). Apparently, sloppy writing at CBS St Louis transformed “between 60 and 80 percent of the time that people spend on the Internet at work” into “between 60 and 80 percent of the time that people spend at work (period)”. What’s more, the reported “60 to 80 percent of the time spent at work” does not, as it stands, mean “60 to 80 percent of the time spent as work”, since many workers have their lunch, including authorized cyberloafing-breaks if they have lunch at their desks, and other authorized coffee-spiked breaks “at work”. If such authorized cyberlunch-and-cybercoffee-break-loafs are subtracted from the total cyberloafing time, the residual true, unauthorized cyberloafing will be a smaller percentage of the work day. 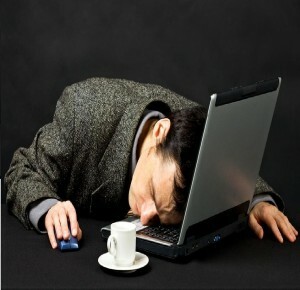 But if lunch and coffee breaks without computer use are subtracted from the work day, the percentage of true cyberloafing as a proportion of the recalculated shorter work day will increase. So, feeling confused (if not shocked) by the CBS report is understandable. If the sensible interpretation of the research as reporting “the percentage of Internet time at and as work spent cyberloafing” is adopted, the percentage of time spent cyberloafing this way may be quite small—and certainly vastly smaller than the 60-80% of the total work-day figure the CBS article reported (especially since “Americans” includes the multitude of workers who do not sit in front of a computer for their entire workday, if they use one at all). ““According to Newswise, the average worker spends 60 to 80 percent of his or her time at the office on the Internet, during which time (s)he is engaging in tasks that have nothing to do with his or her job”? “According to Newswise, the average worker spends 60 to 80 percent of his or her office time that is spent on the Internet engaging in tasks that have nothing to do with his or her job”? If, in fact, 100% of a worker’s office time is spent on the Internet, “office time that is spent on the Internet” becomes, and should be expressed as, “office time, which is spent on the Internet” (which, in being “unrestricted” designates all office time, and not merely the portion of it spent on the Net). That’s “people”, not just “workers”. Imagine, for example, surveying a university careers office and the use of the battery of computers made available at work, but not as work, to students (presumably merely looking for work–or does that count for them or anyone else as work?). Of course, if all the people surveyed were employees being surveyed, not about their Internet behavior in general but, instead, specifically about their workplace and work-time Internet behavior (which is still narrower than what the CBS writer explicitly assumed), at least one (less) shocking statistical claim would stand—the vast majority of workers indeed are cyberloafing up to 80% of their Internet time at (and presumably as) work. But suppose the Newswise report also got it wrong: Suppose the population sample was not limited to workers, but, instead, also included some other cyber-surfing group—for example, students (university, college, high school, etc. ), possibly students in those aforementioned career counseling offices, or maybe in no office at all. After all, one thing that is eternally true of students is that they spend an awful lot of time not studying and not in offices, spending much of it “loafing”–which, these days, means on Facebook. Yes, many students also work, but presumably a well-designed research study would classify students who are working as workers, or at least distinguish their work-time cyberloafing percentages from their non-work time cyberloafing stats. If students—as students and students only—were included in the survey, then, of course, huge percentages (probably 100% in most instances) of their time spent online would not be work-related, thus inflating the final data for cyberloafing at, as or even about (looking for) work online. Were their part-time job habits queried, those students would have to be recategorized as workers, to avoid category confusion and muddying. Now, I don’t know whether the garbled CBS St. Louis report can be attributed to any kind of cyberloafing. Actually, I seriously doubt that. It’s more likely to have resulted from slicing the information loaf the wrong way.